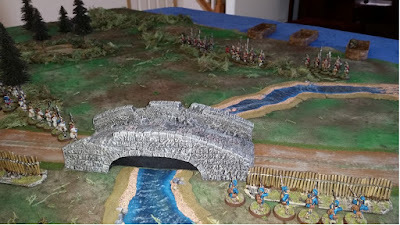 Here are the foot for the Battle of Worringen game which should be on the table in a week or so. 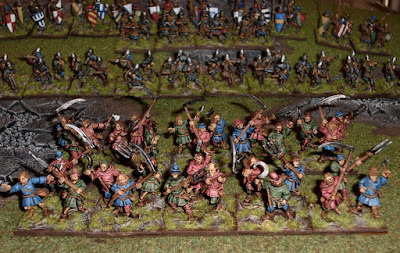 All of the figures, except for the "Revolting Peasants" were painted some time ago. 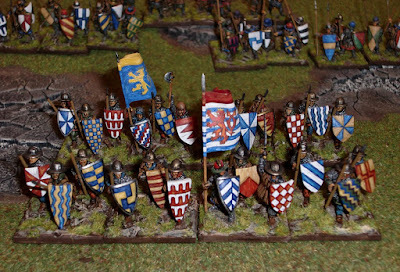 Still need to get flags for the Brabant and Berg forces - both have a lion rampant as their heraldry; Brabant's a gold/yellow lion on a black field, and Berg's a red lion on a white field. 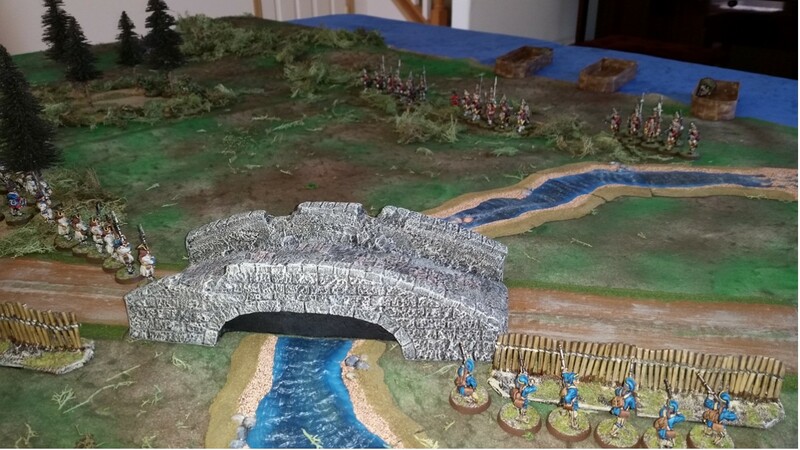 Appropriately the rules intended to be used will be Lion Rampant. It'll be interesting to see how it works as the number of figures for the game, which will include several mounted MAA units will be fairly large for the rules. Anyway, all of the figures were recently based (or re-based) on to 40mm square Litko plywood bases. Here are the recently completed Old Glory "Revolting Peasants." They are the citizens of Cologne who sided with Jan of Brabant. Per the rules, they should be classed as Serfs, but their actual impact at the battle may make them Fierce Foot. These are the Foot Serjeants of Siegfried of Westerburg, the hated Archbishop of Cologne. Hated by the citizenry of Cologne, among others. 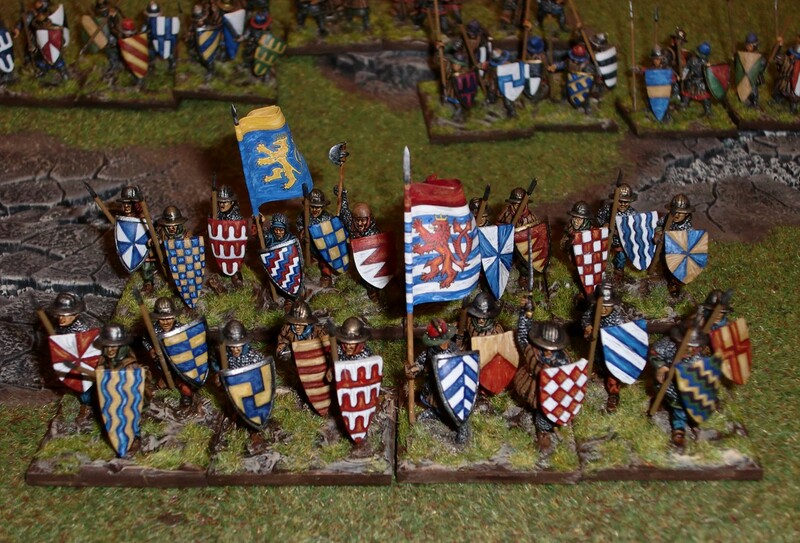 Except for the standard bearer in the front unit which is an Old Glory figure, all the rest are Curteys. The flags represent Luxembourg and Guelders. Siegfried is believed to have used a plain black cross on white field. He was affiliated with the Teutonic Knights. Incidentally, two brothers from the Order tried, unsuccessfully, to negotiate peace prior to the battle. Here are the Foot Serjeants belonging to Jan of Brabant and Adolph VIII of Berg. Still needing their standards. Except for the musician on the far right rear, all of the figures are Old Glory from their Mongols in Europe range. They actually match-up very nicely with the Curteys, but were based separately. 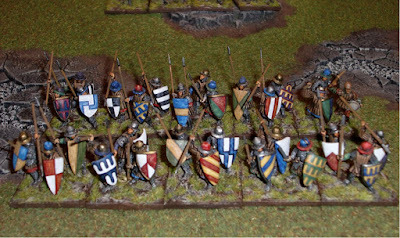 Next are the crossbowmen who will be divided up between both forces. 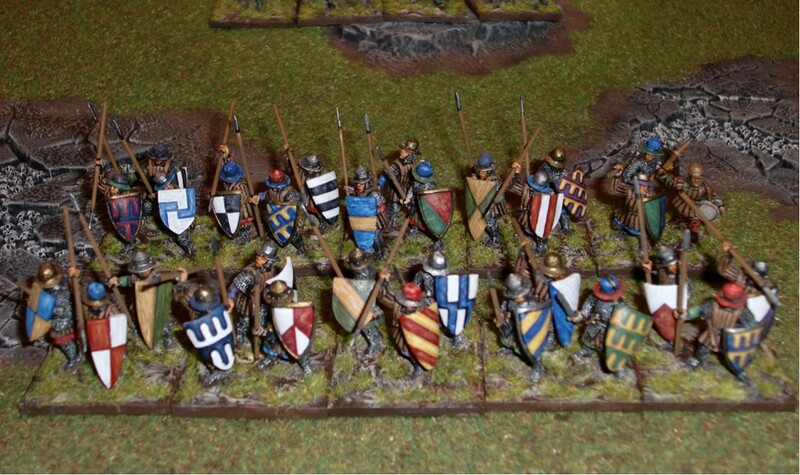 These are Old Glory Normans from their Dark Ages range. 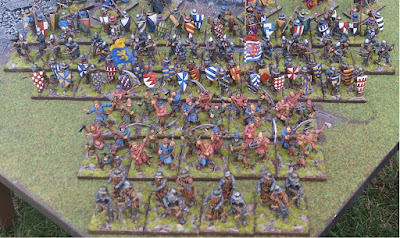 These figures were used extensively in the past in armies ranging from Normans to HYW French - mostly WAB games when they were singly-based. 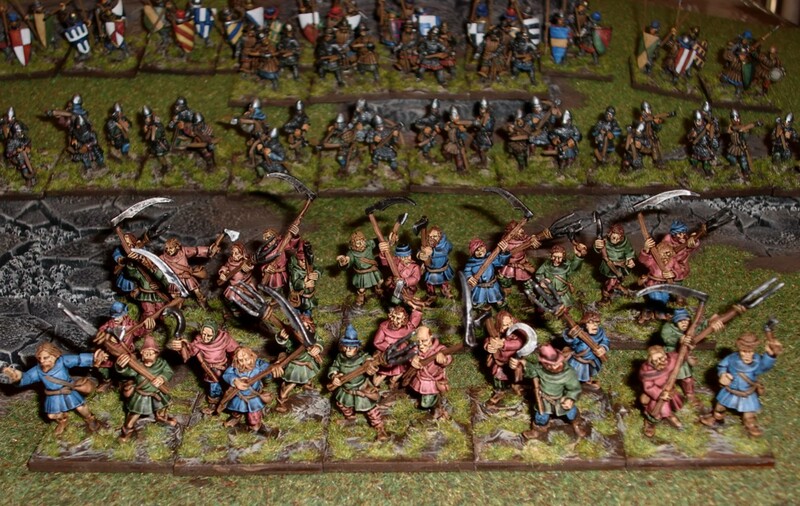 Finally a handful of Old Glory crossbowmen from their Mongols in Europe range. They'll be part of Siegfried's forces. This will be only my second or third Lion Rampant game, and am looking forward to seeing it played out scenario-based versus point-based. The Gude Lude - OG Revolting Peasants! Picked these Old Glory "Revolting Peasants" off of ebay last week. 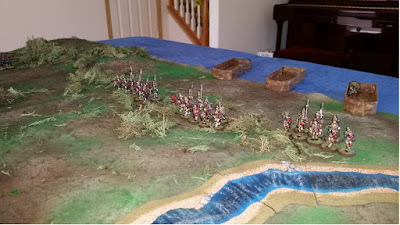 Needed them to be part of a Battle of Worringen scenario. As the "Gude Lude", or Good People of Cologne, turned the tide of the battle in favor of Jan of Brabant, they had to be included. Tired of the heavy handed tactics (and taxes) of Siegfried, the Archbishop of Cologne, the peasantry sided with the forces of Brabant right before the battle. Here are the figures sprayed with Testors Dullcote over a Minwax stain of Tudor Satin. They were quickly block painted using only three muted colors - red mixed with flesh, a pale green, and blue mixed with light grey. This is a very nice set as there are 10 different poses - and each with different head swaps. The large bladed farm equipment being especially eye-catchy. They will be based 3-per 40mm square. 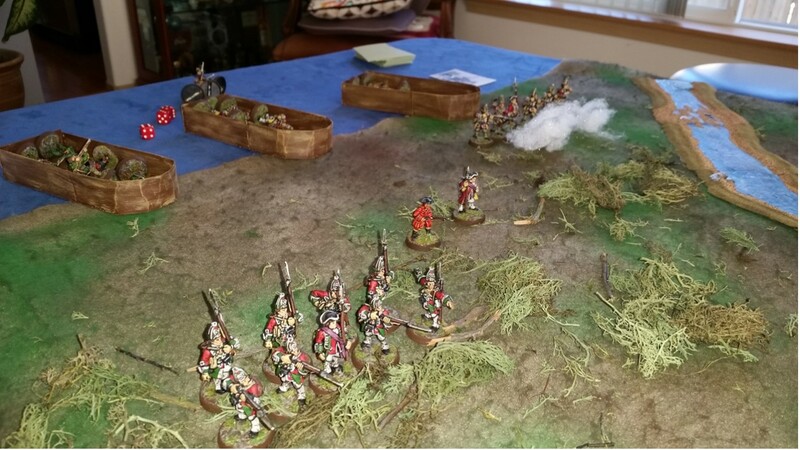 Thanks to my buddy Kimo coming over this afternoon after my youngest son's high school graduation, a nice Muskets & Tomahawks game was played. Although it ended up being different from history with a French victory, it was still quite an enjoyable game nonetheless. Both Kimo and I really like the rules for not only their elegant simplicity, but also the unpredictability of game play due to the card draw activation of units. 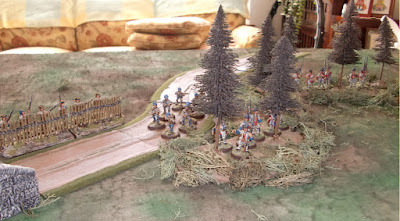 Kimo chose to run the French, which I suspect was due to his former life as a Canadian, and I ran the Redcoats. Without further ado, here are some pictures and captions - hopefully recalled correctly. 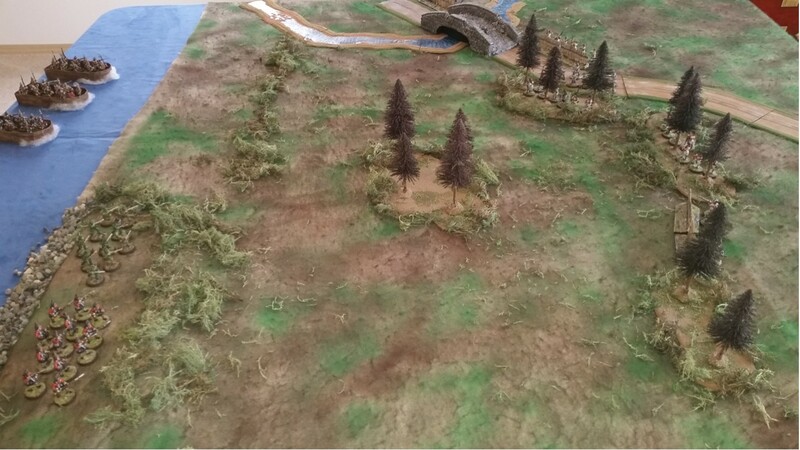 Top of Turn 2 has the 22th, 40th and 45th Grenadiers along with General Wolfe successfully landed on the beach at Freshwater Cove. A few casualties already taken and loaded onto the boats. 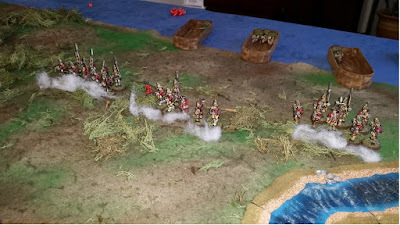 Their movement impeded by the debris strewn along the shoreline by the French. 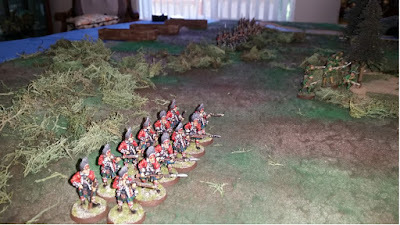 The small detachment of French Marines did a very good job in stymieing the Grenadiers slow advance. The Frasier Highlanders were the largest unit and did the best out of all the British. Here they are after moving down off the bluff to the east of the main landing. 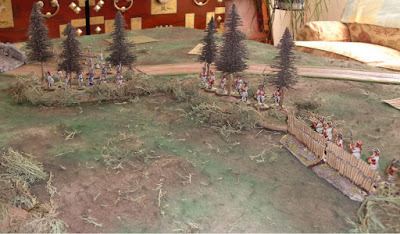 The detachment of Rangers having already reached the wood line to their left. Turn 4 with Wolfe and the Grenadiers still not making much of a headway with their difficult movement inland. Remnants of the Rangers fleeing from taking numerous casualties. 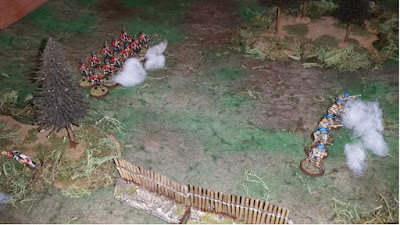 Frasiers taking point blank fire from French Fusiliers as well as fire from French Militia. However, due to lucky saves only taking minimal casualties. 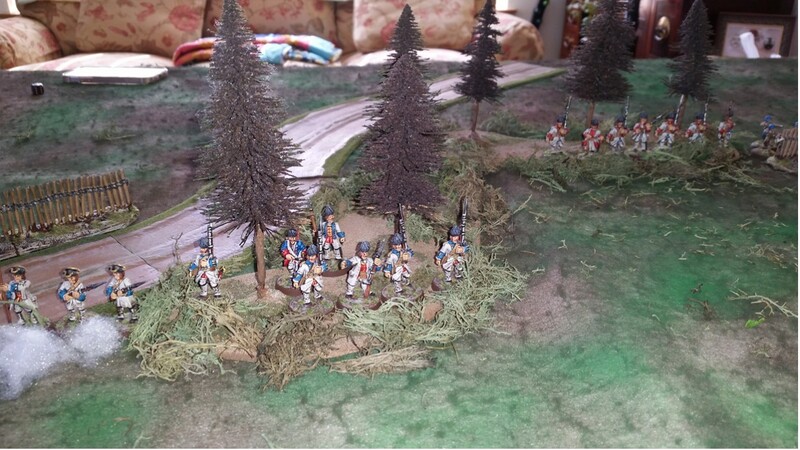 French Grenadiers staying within the safety of the woods. 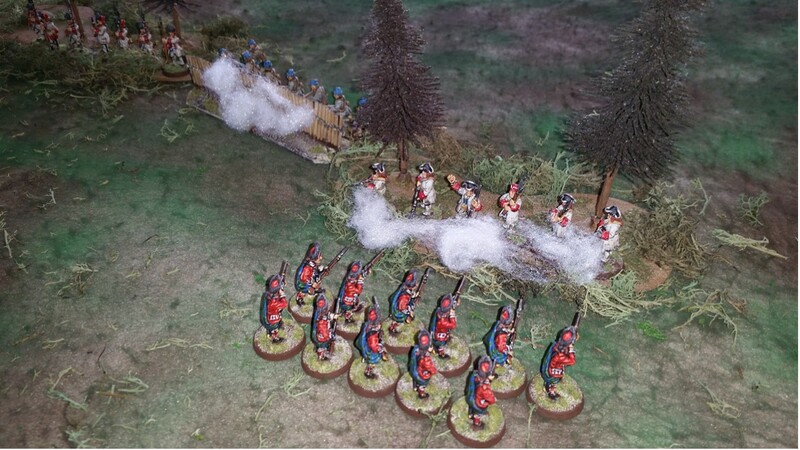 A unit of French Fusiliers being whittled down by British fire. Meanwhile the Grenadiers are still being hampered moving inland with the 22nd Grenadiers destroyed - only their Sergeant and General Wolfe remaining. Note the dead piled up in the boats. Turn 5 has the Frasiers sending hot lead into the backs of the fleeing Canadian Militia - about the only bright spot for the British assault. 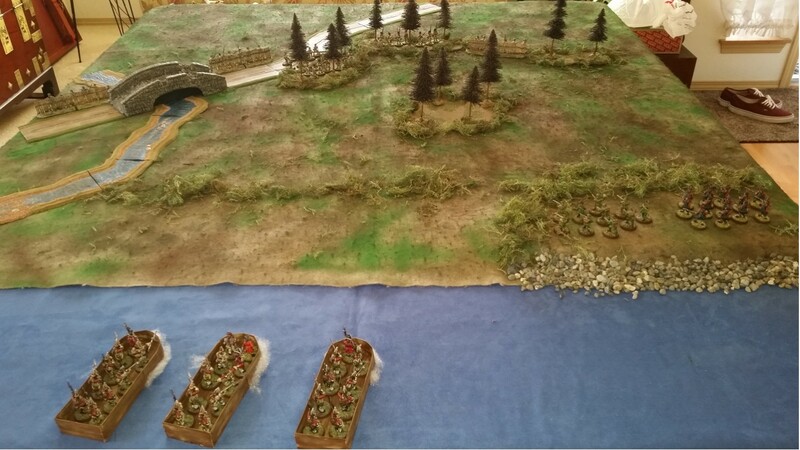 A preliminary layout of a scenario focusing on General James Wolfe's assault on Freshwater Cove during the Siege of Louisbourg in 1758. The basic rules for Muskets and Tomahawks will be used - no side plots. I've played Sharp Practice in the past, but M&T is more to my taste being the simpler of the two. A view looking towards the west. Having found a small area to land along the rocky shoreline east of the beach, Rangers and Frasier Highlanders move toward the enemy undetected. In the distance Grenadiers of the 22nd, 40th and 44th Regiments led by General Wolfe himself prepare to make a contested beach landing. View of the beach with French defenders in prepared positions. Note the rocky shoreline to the Grenadiers' right. Frasier Highland Grenadiers and Rangers atop a bluff overlooking French positions - so far undetected. View of the Rangers and Frasiers from the sea. Each boat will need to use one action to reach the beach, and troops will have a free movement up to 2" from their respective boats upon landing. 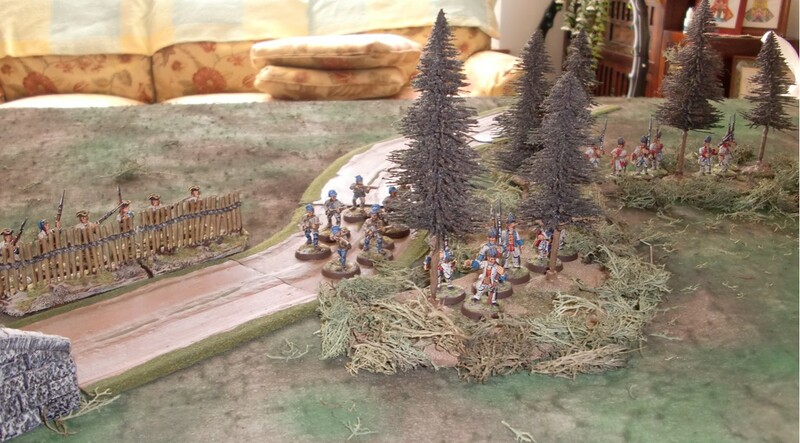 French forces in good cover prepared to receive the British landings - or so they think. A detachment of French Marines secure the right flank. French center with Militia in reserve. This game will be on hold until after my youngest son's high school graduation this Saturday. An AAR will follow. 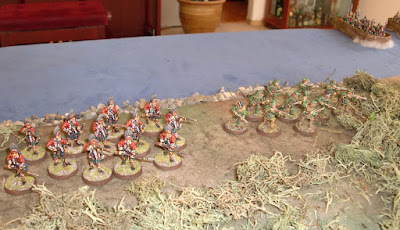 Here are some Foundry British Grenadiers which will be used in a beach assault for a Musket and Tomahawks game. 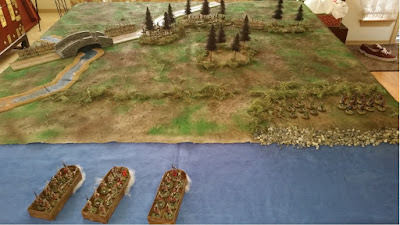 Wanting to replicate Wolfe's seaborne attack at Freshwater Cove during the Siege of Louisbourg, a few boats were needed. There are some pretty nice (and decently priced) boats on the Old Glory 25's site, but they were a bit longer (9.5 inches) than I wanted for the scenario. I ended up constructing these boats using a base of foam core and glue-gunning card stock around the edges. Rather crude, but it was quick and easy. 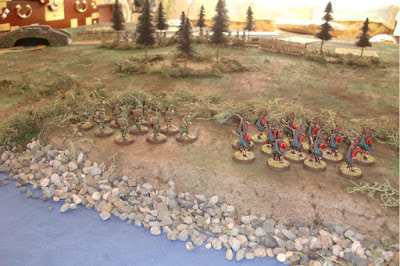 They are 6" long by 2 1/4" wide, and can fit up to 10 figures on 25mm round bases. As the boats will only be used for the initial movement onto the beach using one Movement Action, they didn't need to look very pretty. Upon reaching the shore, the Grenadiers will have a free movement onto the beach up to 2" from the boat. While still in the boat, they could fire if they have LOS; the boats provide light cover as well. 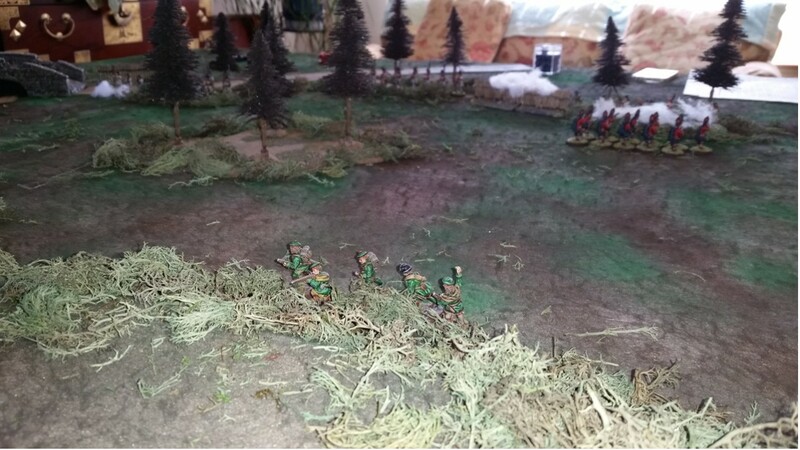 For the scenario, a detachment of Rangers and a unit of Fraser Highlanders will already be on shore upon a bluff to the east of the cove. General Wolfe will be in one of the boats with the Grenadiers. The next images are WIP shots of the boats. Took about an hour from start to finish. Foam core used as the base for the boats. Card stock quickly glue-gunned around the foam core bottom. They ain't pretty but they'll get the job done.